Trendsetter is a 71001 Minifigures Series 10 Minifigure released in May 2013. The Trendsetter is based off of a stereotypical teenage girl. She has a new blonde hairpiece and she wears a pink-and-white striped tank top. She also wears a heart necklace similar to the Pop Star's, lipstick, and a pair of sunglasses. She has a pair of white jeans with a rhinestone belt and some silver chain designs. 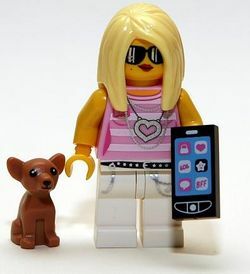 Her two accessories are a dog resembling a brown chihuahua and a 1x2 tile printed to resemble a smartphone, iphone, ipod, blackberry, etc. The apps printed on it also depict the stereotype of a teenage girl, with symbols showing a heart, shopping bag, a star, a speech bubble, and two icons saying "LOL" and "BFF" (text language for "Lot's of Laughs / Laugh out Loud" and "Best Friends Forever"). This page was last edited on 10 January 2016, at 00:56.